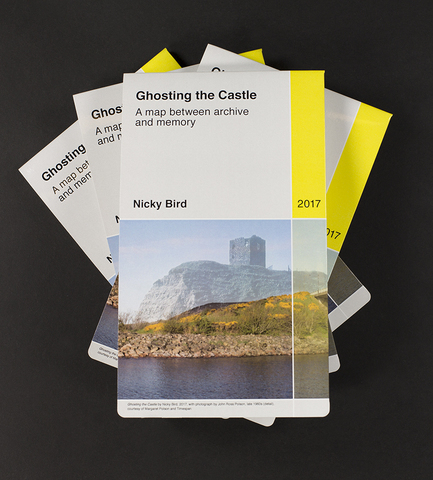 Ghosting the Castle: A Map between Memory and Archive by Nicky Bird, 2017. Published by Wild Pansy Press. An edition of nine fold-out maps, OS Landranger size 1000 x 890mm. Design and layout by Chris Taylor, Wild Pansy Press. An output from the Timespan commissioned project 'Ghosting the Castle', 2017, which focused on the layered histories and issues related to Helmsdale’s medieval castle and the A9 bridge which replaced it. These have been investigated through the archives of Timespan, National Records of Scotland and Historic Environment Scotland, alongside collected memories and knowledge of the site. The map was created from the combination of materials located in public and private archives, including personal postcard collections, family photograph albums as well as a construction company photographic album.